We create drawings fast and with unparalleled accuracy using the newest, integrated thermal camera technology. Our Leica imaging laser scanner is the result of uncompromising dedication to a minimalistic aesthetic and the simplification of reality capture. You can count on our experienced team of designers to deliver exceptional work at a competitive price. Our design work includes residential & commerical drawings, layouts and floor plans. We provide residential and commercial drawings for new structures. Add-On’s and additions to existing commercial and residential structures. We create drawings that depict the structural details of buildings and their corresponding relationships. We also produce mechanical drawings including conceptual layout, assembly, parts and machine designs. From start to finish, we provide everything needed to get a permit from your city. We make the process easier and fast! We use computer aided design and drafting systems (CADD) to produce expert, fast and accurate layouts and diagrams. We produce detailed project presentation renderings. We use the Leica BLK360 Imaging Laser Scanner to record precise measurements with unmatched speed. Our team can reliably create fast, accurate and detailed drawings for any existing residential or commercial structures. 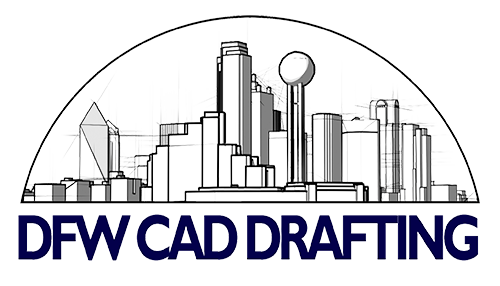 Contractors and manufacturers trust DFW CAD Drafting to create professional Shop Drawings. These may be used to show the placement of prefabricated components, or to plan the installation of metal duct and electrical work, piping and fire protection.